President Obama’s executive action on immigration, expanding deportation relief to millions of undocumented immigrants, attracted strong public interest last week. Overall, 39% of the public say they paid very close attention to news about Obama’s policy allowing certain immigrants living in the U.S. illegally to remain in the country. A third (33%) tracked news about the outbreak of the Ebola virus very closely while about as many (31%) tracked news about the Islamic militant group known as ISIS. Amid anticipation over a grand jury ruling in the police shooting of an unarmed black teenager in Ferguson, Mo., 25% say they are following developments in the shooting death of Michael Brown very closely. That is on par with interest in the weeks following Brown’s death in August. News interest in Obama’s new immigration policy is nearly as high among whites (37% following very closely) as among Hispanics (45%) and blacks (44%). There are wider racial differences in interest in other stories, notably Ferguson and Ebola. 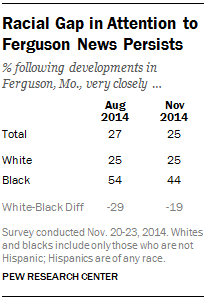 About four-in-ten blacks (44%) tracked developments in the Michael Brown case very closely compared with 25% of whites. And blacks are much more likely than whites to say they tracked news about Ebola very closely (52% vs. 29%). 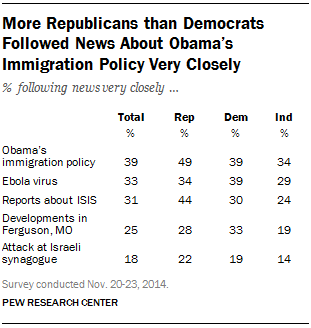 There also are partisan differences in interest in several of last week’s stories. Notably, a greater share of Republicans (49%) than Democrats (39%) say they followed news about Obama’s new immigration policy very closely, and Republicans are 14 points more likely than Democrats to follow news about ISIS very closely (44% vs. 30%). See the topline and full survey methodology.